We took Sweet Girl to see Santa last week. For the annual photo with Santa experience. It’s a weird custom when you think about it — something an online friend who grew up in the UK (waving at you Emma) pointed out to me once. Hey, Sweet Girl, we want you to sit on a stranger’s lap and tell him all about yourself and what you want for Christmas. Don’t forget to smile and contrary to what we’ve told you in the past, when he hands you candy – take it. I do want to state that if she told us she didn’t want to go, or if she cried hysterically at the thought of sitting on Santa’s lap, we wouldn’t make her do it. But she seems to not mind Santa at all, and so the (I guess only North American?) tradition stands. 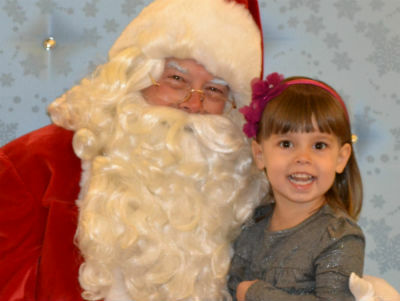 We of course talked about the visit and photo with Santa well in advance so Sweet Girl would know what to expect. And so she could think about what she would like to ask the big guy in red for Christmas this year. Sweet Girl knew right away and was very straightforward in telling me. She wants a princess headband, a necklace and two bracelets. While I don’t really know what a “princess headband” is, I’m guessing it features sparkles and the colour purple or pink (or any combination of the two). I’m sure Santa’s elves can figure it out. I keep asking myself how I got off so easy. That’s it? That’s all she wants? And it is. I asked her a few times and she repeated her gift wish verbatim. I’m counting my blessings because next year I’m sure she’ll ask Santa for something obscure or impossible for Santa to provide (like a baby brother or a pet alien). I’m glad Sweet Girl is keeping her list short and simple. It makes Santa’s job so much easier. On a related note, I thought this article — What NOT to F’ing buy my kids this holiday — by Karen Alpert (aka Baby Sideburns) was quite funny. It’s a shout-out warning that all gift-givers (not just grandparents) should heed. While of course tongue-in-cheek, some of the do-not-buy reasons are valid. For example, we too do not need another stuffed animal in our home. Just sayin’, people. Just sayin’. What is your family doing to keep gift-giving simple this holiday?